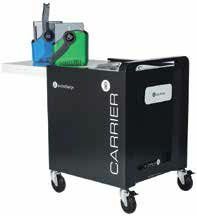 The Carrier 30 Cart features a compact design and comes with a lifetime warranty. Featuring a top-loading design, it allows students to access devices quickly and it takes just minutes to wire. A two-point locking system and heavy-duty steel construction protect the devices. The cart comes with an external charging display and power outlet to easily charge and monitor the status of the devices. The Carrier 30 Cart comes with Baskets that make deployment faster, safer, and more efficient. The Baskets can hold virtually any 13-inch device. The cart has a soft closing, sliding lid on top that makes it easy for teachers and students to access the Baskets within the cart. To accommodate larger devices, the cart has a three-level adjustable storage shelf that allows schools to store and charge devices up to 17-inches. Store and charge devices in less space with the PowerGistics 20-shelf wall-mounted towers. This tower will accommodate devices in the classroom, library, or media center. Device power bricks and cords are neatly secured and protected in the back spine while the steel door secures the devices with a keyed locking system. Towers can easily be mounted to any wall, making use of vertical space in the classroom while devices safely lie flat in their natural position, protecting them from spine and cord damage. The PowerGistics cable management system saves money in replacement cost as well as deployment time. Students can easily manage charging of their devices with an open vertical design for easy visual inventory and charging status. The open door concept allows for quick visual inventory of devices, while the steel door ensures security. Peerless-AV’s new line of SmartMount Collaboration Carts with Vertical Lift (SR584VL2, SR584VL3) are ideal for education settings. Offering a maintenance-free design with no motors to service or replace, the vertical lift carts enable a virtually seamless interactive experience. Meeting the ADA Standards for Accessible Design, Section 308, Peerless-AV’s new vertical lift carts allow users to quickly and easily raise or lower a display to their preferred height or for wheelchair accessibility with the simple touch of a finger. The carts’ mobile solution uses 4” lockable casters, corner bumpers to prevent damage to walls and doors, integrated handles to help maneuver the cart, and an extension cord wrap for fast deployment. Charge ‘N Roll is a convenient, compact, durable storing and charging cart for tablets and mobile phones. With its custom foam interior slots and cover, Charge ’N Roll safely and securely stores and transports up to 15 tablets, sized up to 9.4” x 6.67”x 0.24”. The number doubles to 30 when storing mobile phones only. Designed to make charging easy, Charge ‘N Roll’s whisper-quiet fan ventilates and cools the unit for optimal usability. Built for easy mobility, Charge ‘N Roll has a rugged tough exterior, two easy-glide wheels, and a retractable pull handle. With four secure latch locks (two of which are padlock-capable), Charge ‘N Roll makes an ideal transporting, storing, and charging case cart for schools. Introducing TechGuard Connect from Bretford, a secure charging locker featuring Bretford Connect, the cloud-based portal with real-time locker management. Remotely access locker stats, unlock bays, and view a full audit trail through data logging. Select from RFID or keypad user access, wired or wireless data, and AC or USB power options. TechGuard Connect, with its intuitive smart platform, Bretford Connect, allows IT teams greater flexibility to manage entire fleets of lockers from one central management platform. And, because it is scalable, it can be added to and updated at any time. Bretford Connect’s cloud-based service allows schools to take TechGuard Connect off of their networks and operate on the go, giving them greater flexibility to manage fleets of devices. CDI’s mobiLAB SC33 charging cart by eduGear supports schools’ 1:1 initiatives. The cart can hold up to 33 devices that are 14 inches in size. Designed for Chromebooks and Notebooks, it features slide-out shelves, smart charge technology, 90-degree mounted power outlets to accommodate various adapters, a convenient cable management solution, and a small footprint. It also comes with wheels, bringing both mobility and convenience to the classroom. This cart’s second-generation smart charge technology protects the Chromebooks and Notebooks while ensuring the quickest charge. Slide-out shelves make placing and removing devices easier and safer. The cart’s small footprint (29 inches wide, 24.33 inches deep, and 40.75 inches high) means it takes up less valuable real estate in the classroom. It is UL-certified and includes a lifetime warranty on parts and a limited three-year warranty on electrical components. The Wall Mounted Tech Tub is one of the newest members of the Tech Tub2 family. This new bracket is sold as a kit with a Tech Tub2 that holds six devices, or separately to use with previously purchased Tech Tubs. It puts device charging up and out of the way and is designed to hold six iPads, Chromebooks, or other tablets. The low profile steel wall bracket folds away when not in use and offers a versatile hole pattern for mounting to brick, studded walls or other surfaces. Unlike other wall-mounted storage options, the Tech Tub2 Wall Mount allows for the devices to be up and out of the way, or they can simply be unlocked from the bracket and moved throughout the classroom or school. The Wall Mounted Tech Tub2 is also useful in 1:1 situations; by placing several around the classroom, deployment bottlenecks can be reduced.